No, it’s not a road trip to Wally World. Sarah’s just trying to protect yet another Skynet target from getting exterminated by a cyborg. In this case, she’s not actually sure who she’s protecting, only that the family’s name — “Fields” — is one of those written on the blood wall. (Actually, “Alpine Fields” is written on the wall, and although it’s never stated, my assumption is that Alpine is the name of the town they’re in … there’s an Alpine, CA about half an hour to the west of San Diego, up in the mountains, at the edge of a state park. Sounds like the place, right?) Her suspicion is that it’s the father, a bookkeeper who has had illicit financial dealings with a cybernetics company, but it’s really Sydney, the mother’s unborn child by another man, who won’t be born for another six months. While under attack from a T-888, Sarah and Cameron manage to protect the family, and give them the wake up call they need to go on the run. The interesting thing is, that was “six months before”. 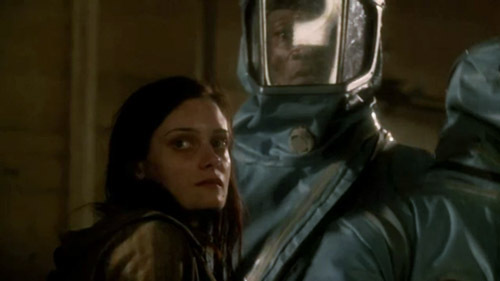 To further keep us on our toes, this episode also involves a flash-forward to 2027, to Derek’s past (our future), in which Skynet has developed a bioweapon to kill off humans in much the same way — as Jesse informs us — that Australian scientists developed the Myxomatosis disease in the 1950s to curb their critical rabbit infestation problem. Which makes for a really apt metaphor: Skynet doesn’t consider humans an equal, opposing army; it consider humans a pest to be eradicated. Anyway, as happened with the rabbits, a small percentage of the human population is immune to the bioweapon. Sydney Fields is one of those who is immune, and this is why Skynet wants her dead, and why Derek goes looking for her in the future. 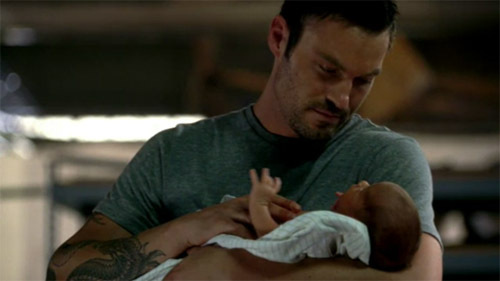 Along with Jesse — who he meets for the first time during this mission — Derek finds Sydney, brings her back to the Serrano Point Resistance base, and they are able to create a vaccine. “We got a scrubbed Trip-8 for a captain.” Jesse is referring here to the neutered T-888 that her people have running all hands on the nuclear submarine they use to travel from continent to continent. I liked the way she phrased it all Australian-ese and the concept itself, which boggled Derek. 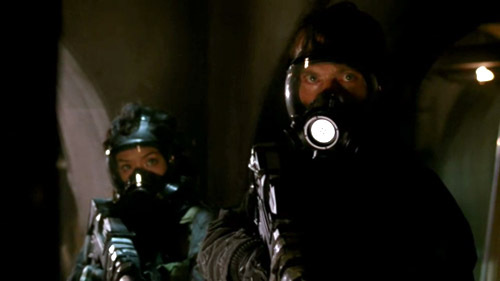 “They always come through the front door.” Sarah says this about the terminators when the family asks her what will happen if the cyborg that Sarah is setting a trap for chooses not to come through the front door. I cracked up when I heard it, because it’s true. They always do!